This electric M4 airsoft rifle is the Double Eagle’s 1:1 scale replica of an actual M4 rifle. 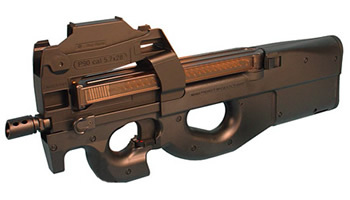 It has the option for fully automatic or semi automatic and safety with an adjustable hop-up system, if you hold the trigger down it keeps firing! This electric M4 airsoft rifle is an exact replica of what US Troops are using in Iraq currently. Modeled after the M16A4, it has Weaver rails on it like the current version used by US troops so you can mount a ton of different scopes and other accessories. It’s made from ABS plastic, very durable, and it has a heavy weight feel that makes it more realistic and sturdy. 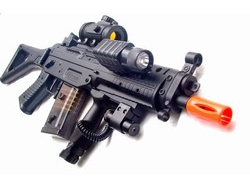 The stock on this electric M4 airsoft rifle is collapsible to fit any size person. 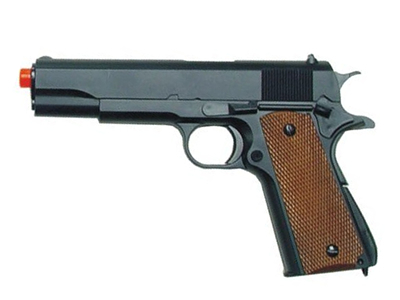 The inner barrel is made from metal. It shots 6mm BBs at 240 feet per second. 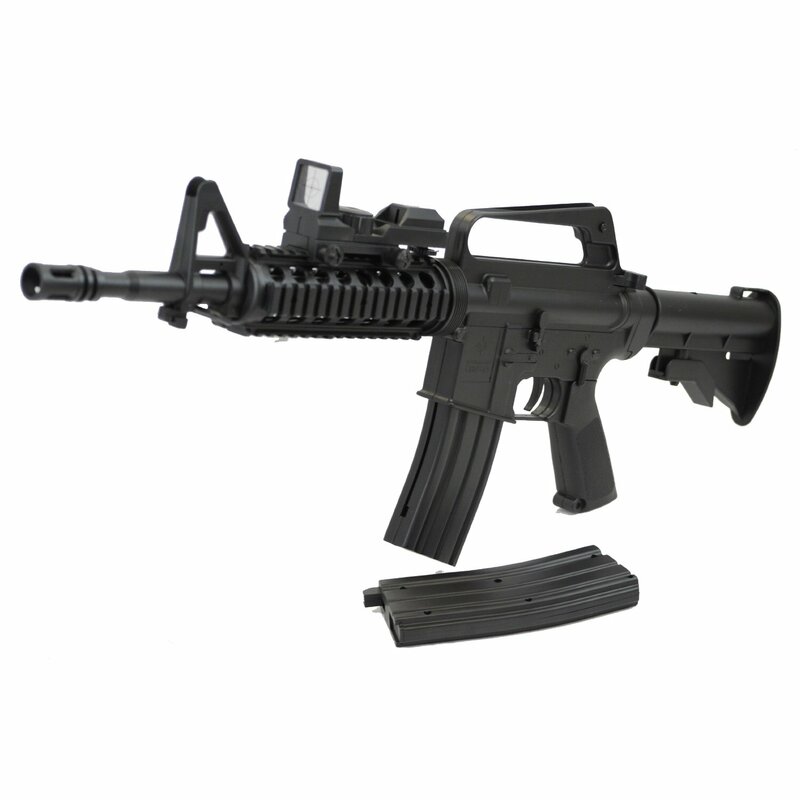 Double Eagle’s electric M4 airsoft rifle has RIS system installed with 2 rail guards and features a “high torque” motor. The package comes with heavy duty rechargeable battery (it comes with two 7.2 Ni-CD interchangeable batteries, so you won’t go through tons of batteries with this one) and its wall charger. Charge 4-6 hours and with that charge it will shoot around 3000-4000 bbs. Not only that, but it already comes with rifle handle, shooting glasses, adjustable electronic gun sight, adjustable laser aim module, flashlight, rechargeable battery with charger, 100 6mm BBs and silencer. The forward grip is an awesome addition, because it helps you pull the rifle into your shoulder deeper for better accuracy. 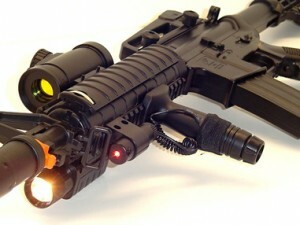 See more info about this awsome electric M4 Airsoft rifle on the seller’s page.